Thread: Could Chevrolet Bolt EV Become the Crown Vic of Ride Hailing? Electric cars, with their punchy low-speed response and low operating costs (if you don?t count resale-value issues), seem like ideal vehicles to use for urban shuttling. Which is why General Motors has been offering, through its Maven mobility company, the Chevrolet Bolt EV as a weekly rental to members who drive for ride-hailing services including Uber and Lyft. And early indications show that the Bolt is proving adept in that role, which makes us wonder: Could the Bolt become to the ride-hailing business what the Ford Crown Victoria was to traditional taxi companies? Granted, it?s a small sample so far: 55 Bolt EVs have been placed into service in San Francisco and San Diego. 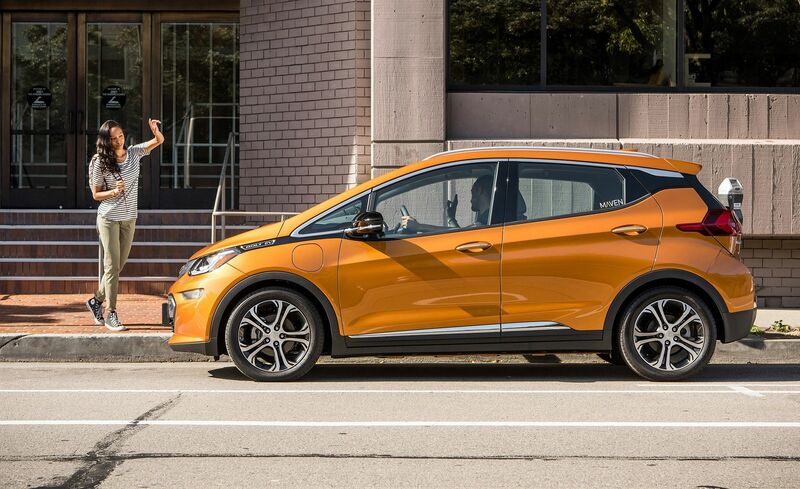 Maven includes maintenance, insurance, and access to the EVgo charging network in exchange for data on driving distances and charging habits, which has shown that the Bolt EVs have transported 20,000 passengers since early February. Furthermore, ride-hailing drivers have embraced Level 3 DC fast charging, and perhaps because of that, the Bolt EVs are covering about as many miles per day as their gasoline counterparts. With well-planned use of fast chargers, some drivers have covered more than 300 miles in a day, with some going more than 400 miles. DC fast charging is a $750 option on the Bolt EV and-along with the Bolt EV?s 238-mile EPA range-is a major factor enabling the EV to match the daily driven miles of a gasoline car. Those Bolt drivers have plugged in for about 2500 DC fast-charging events versus only about 200 Level 2 charging events, logging more than 200,000 miles total. Of course, not all drivers have found it to be smooth sailing; there?s a steep learning curve for finding public charging stations-and consumers need a lot more education on the differences between Level 2 charging and Level 3 DC fast charging. Could Ride Hailing Make Charging Networks Viable? Although public charging networks are essential if the electric-vehicle market is to grow, it has been a struggle to make them financially viable in the short term without subsidies from government and automakers. Although some automakers-especially BMW and Nissan-have invested in charging networks and Tesla has built up its Supercharger network, General Motors has shied away from making such investments. Yet the Maven project shows how the automaker could see justification for a public-charging model. According to Alex Keros, manager and senior project engineer at Maven, just the few dozen Bolt EVs in heavy use have taken some of the EVgo stations in those two metro areas to 30 to 40 percent utilization, up from 10 to 15 percent before. "There are a lot of kilowatt-hours being spent here, and it?s helping to drive the business case associated with infrastructure," Keros said. "For the first time we?re starting to see a light at the end of the tunnel . . . to build a business case, so that we?re not totally subsidizing public charging." And then there are the marketing benefits. Each Bolt EV ferries about 10 passengers daily on average, passengers who may not have otherwise had exposure to the car. If their experience is positive, that could spur further sales-something that probably never happened for riders stuck in the back of a Crown Vic.